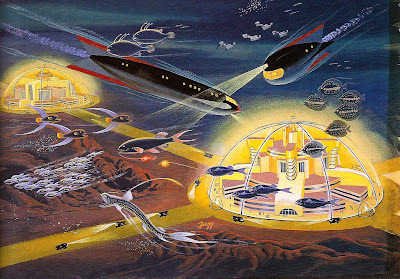 Forget jetpacks, Martian colonies and floating cities. We may have found the most astonishing claim made by anyone of the paleo-future. 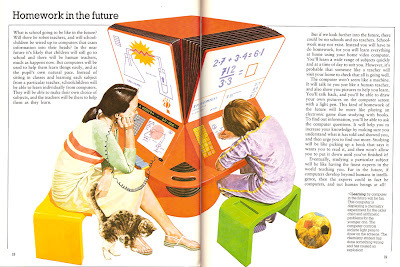 According to the 1981 book School, Work and Play (World of Tomorrow), in the future, homework will be fun! Upon hearing the news every child of the early 1980s choked on their bologna sandwich. Learning by computer in the future will be fun. This computer is displaying a chemistry experiment for the older child and arithmetic problems for the younger one. The computer controls include light pens to draw on the screens. The chemistry student has done something wrong and has caused an explosion! 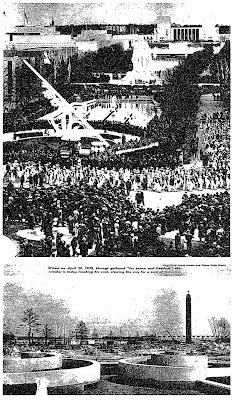 The Chicago Daily Tribune ran an article in their April 26, 1959 edition proclaiming, "In 50 Years: Cars Flying Like Missiles!" Below is an excerpt from the piece. Can you imagine an autoist driving up to a "gas" station 50 years from now and receiving replacement energy capsules for his car instead of getting a tank full of liquid fuel? These were possibilities discussed last week by Dr. Andrew A. Kucher, Ford Motor company vice president in charge of engineering and research, in an address at Northwestern university. In 1994 Apple Computer ran a series of ads that were essentially reflections on the paleo-future. The idea was that with the Power Macintosh the real future had arrived. 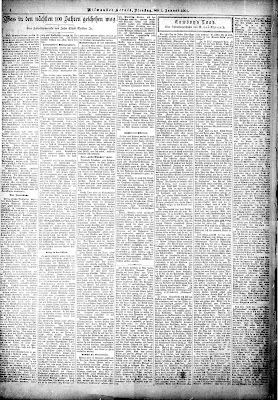 In the March 8, 1929 issue of the Chronicle Telegram (Elyria, Ohio) Roger W. Babson made predictions of what the future held. Below is an excerpt under the heading of "Stocks and Bonds." Babson couldn't estimate how quickly everything was about to change and that it would be for the worse. It almost reminds me of an Onion article in its optimism for the future. In finance there will also be marked changes as the years roll by. The present generation has been chiefly interested in trying to buy and sell stocks and bonds at advantageous prices. While this is an important aspect of finance, it is very far from being the only aspect and perhaps it cannot be called the most vital aspect. I am ready to make this forecast, that during the next twenty years the public will develop a totally new viewpoint toward finance. The word will not only take meaning for thousands of people of very moderate income, but those of wealth will get entirely fresh concepts. I foresee with especial assurance that the field of trusts will offer great opportunities. The American public is being taken into partnership in our great industries of large scale. I feel very positive that the number of people interested in stocks and bonds will increase far out of proportion to the mere increase in population. 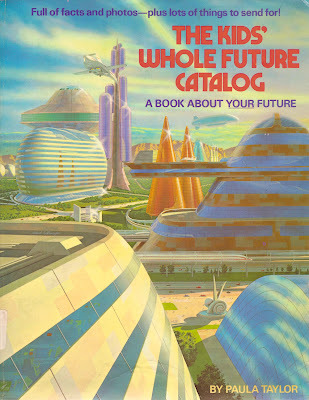 The 1982 book The Kids' Whole Future Catalog features a broad range of paleo-futuristic hopes and dreams. 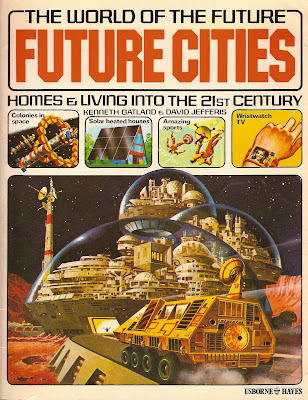 From floating cities to rocketbelts this book runs the gamut of 1980s futurism. Unfortunately, it also contains some scam artists such as Uri Geller. For the most part it's a great read and we'll definitely be checking out more from this book over the next few weeks. 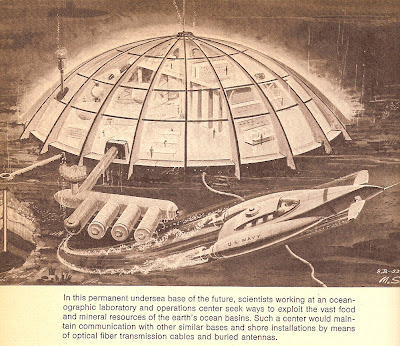 The 1973 book 1994: the World of Tomorrow has yet another example of future colonization of the world's oceans. 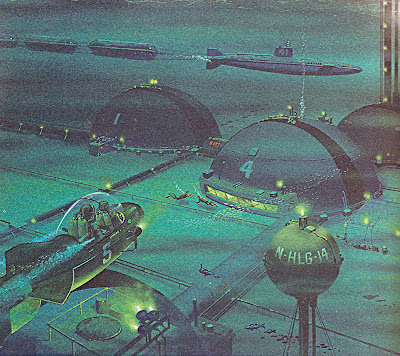 In this permanent undersea base of the future, scientists working at an oceanographic laboratory and operations center seek ways to exploit the vast food and mineral resources of the earth's ocean basins. 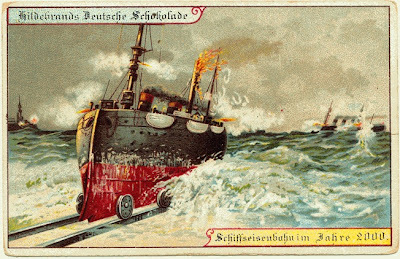 Such a center would maintain communication with other similar bases and shore installations by means of optical fiber transmission cables and buried antennas. 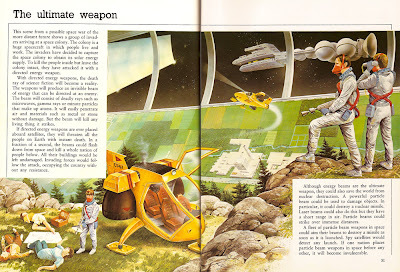 The 1982 book The Kids' Whole Future Catalog made the rather ambitious prediction of entire industries sprouting up in space by the year 2000. In the future, products from space will be in great demand. 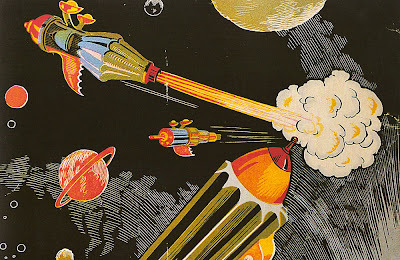 Economists are predicting a 20 billion dollar market for space-made goods by the year 2000. 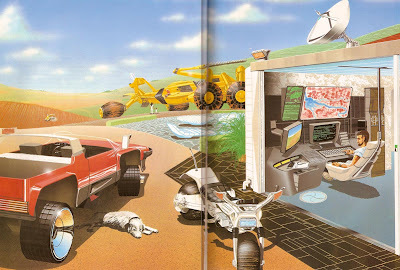 After spending the past two weeks looking at the 1993 video, Connections: AT&T's Vision of the Future, I think we've learned a lot about the paleo-future. Most interestingly, we've learned that the communications networks of tomorrow will be highly rational, controlled systems brought to you by AT&T. Below are all nine parts of the 14-minute video. Enjoy. 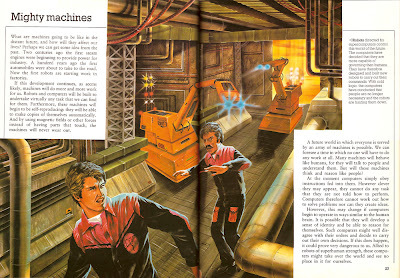 In all the futurism books written for children, this may be the most hilariously disturbing two-page spread I've seen. This image, from the book Fact or Fantasy (World of Tomorrow) depicts robots that have determined humans are no longer necessary and now must be hunted down. 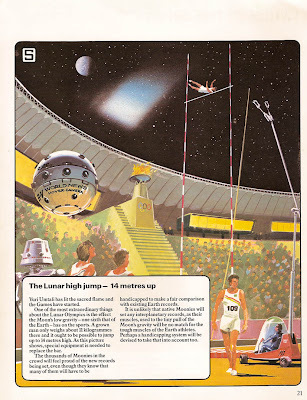 I can just see some little Billy or Susie in the early 80s reading that, "...allied to robots of superhuman strength, these computers might take over the world and see no place in it for ourselves." The aforementioned child then proceeds to poop their pants. Part 8 of our 9 part series looking at the 1993 video Connections: AT&T's Vision of the Future begins with some rather mundane character development and moves into the final resolution of the dispute over a new housing project. "Mountain Climbing Bear" also makes a cameo. It's noteworthy that we don't get to see the entire car he's driving (I guess their budget wasn't that big) but we still get the picture that we're in the future. Stay tuned for the thrilling conclusion. 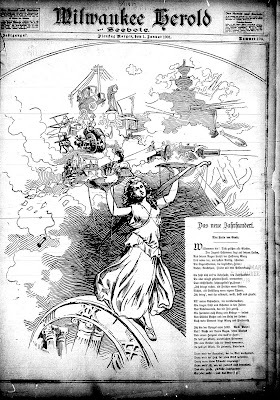 This ad requesting submissions for the Tricentennial Report begins with, "We have always been a nation more interested in the promise of the future than in the events of the past." Curiously, the second sentence then plays Debbie Downer with, "Somehow, the events of the past few years have made us doubt ourselves and our future." Watergate? The Vietnam War? I didn't know the U.S. 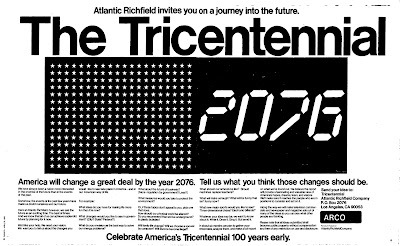 Bicentennial was such a depressing event. We'd like your help. We need your vision. We want you to tell us about the changes you would like to see take place in America - and in our American way of life. Or if those topics don't appeal to you, pick one that does. What will make us laugh? What will be funny that isn't funny now? In about six months we plan to gather your responses, analyze them, and make a full report on what we've found out. We believe the report will provide a fascinating and valuable view of America's hopes, dreams, fears, and visions. We'll make sure it reaches the people who are in positions to consider and act on it. With concepts like "linking to the Education Center in Washington, D.C." AT&T clearly had ideas about the infrastructure of the Internet that didn't quite pan out. Part 7 of the 1993 video Connections: AT&T's Vision of the Future gives us a glimpse of a computer-centered classroom where kids can learn at their own pace, thanks to digital teachers. 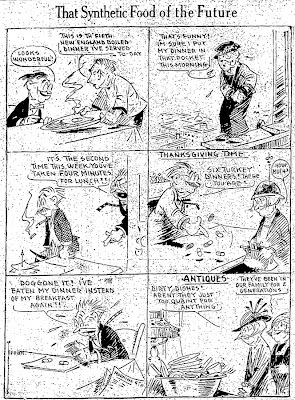 This cartoon appeared on page 10 of the Ogden Standard-Examiner (Ogden City, Utah) on September 19, 1926. In a clear homage to Dilbert, the boss in panel three screams, "It's the second time this week you've taken four minutes for lunch!!" It seems like everyone's stealing from Scott Adams these days. 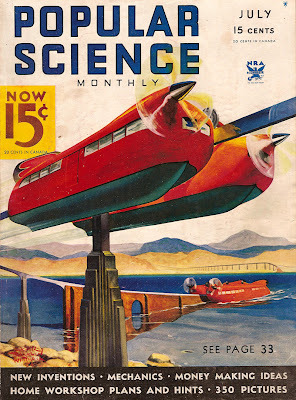 The July, 1934 issue of Popular Science features the sleek, modern look we often see in this era of the paleo-future; beautiful images filled with hope that the future could somehow hold promise. 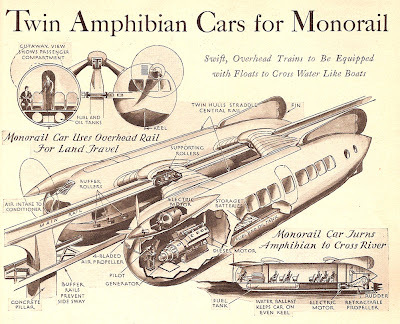 Amphibian trains that can whiz above desert sands on an overhead rail, or plunge into the water to ford a river, are contemplated by the Soviet Government in an amazing plan to tap mineral wealth in Turkestan. They are to travel three projected monorail lines of unprecedented design, totaling 332 miles in length and crossing deserts and rivers. A single overhead rail on concrete standards could be erected at low cost along these routes, engineers estimate. Air-porpelled cars with twin, cigar-shaped hulls could straddle the track and glide along it, at speeds reaching 180 miles an hour, according to calculations based on tests of models at Moscow. 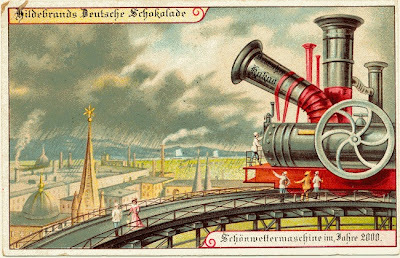 The cars would be equipeed with Diesel-electric drive, and each would carry forty passengers or an equivalent freight load. Where the longest of the projected routes crosses the river Amu-Daria, a mile and a quarter wide, it is proposed that amphibian cars be used. 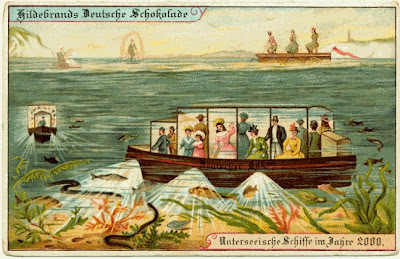 On arriving at the shore the cars would leave the overhead rail and cross the river as a boat. Soviet engineers are reported already surveying the route. 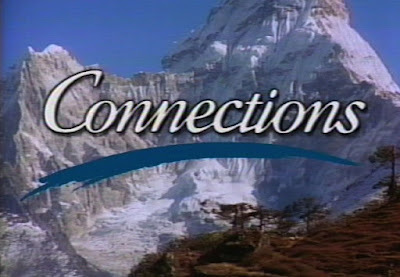 Continuing our series of clips from the 1993 video Connections: AT&T's Vision of the Future, today we have part 5. 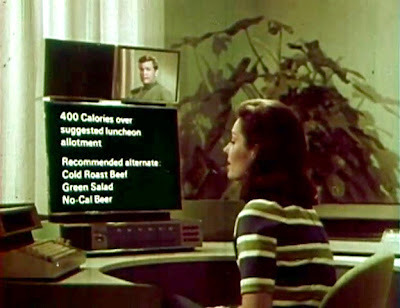 Practicing medicine over picturephone, personal computer assistants and a glimpse of the classroom of the future are just a few of the paleo-futuristic wonders featured in this clip and clips to come. Yesterday we looked at Hubert H. Humphrey's vision of 1967-1987. 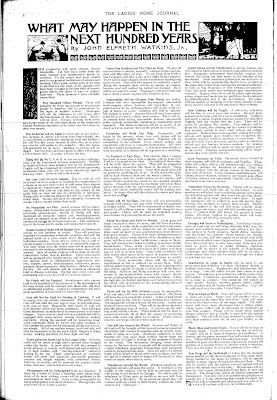 Today we have the second part to the Vice President's piece in the February, 1967 issue of The Futurist. The virtual elimination of bacterial and viral diseases. The correction of hereditary defects through the modification of genetic chemistry. The stepping-up of our food supply through large-scale ocean-farming and fabrication of synthetic proteins. 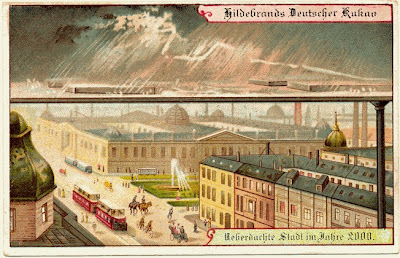 Control of the weather, at least on a regional scale. 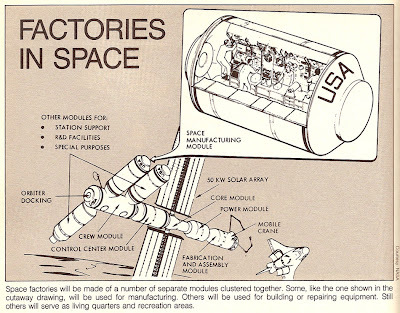 In space, the landing of men on Mars and the establishment of a permanent unmanned research station on that planet. The creation, in the laboratory, of primitive forms of artificial life. This can indeed be an age of miracles. It will be your age. 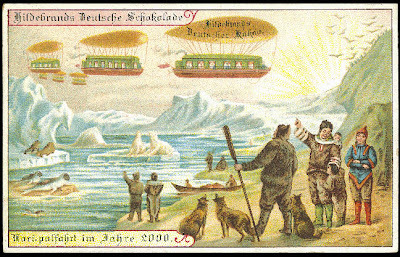 The ocean and space continue to pop up as the paleo-future's greatest unexplored frontiers. 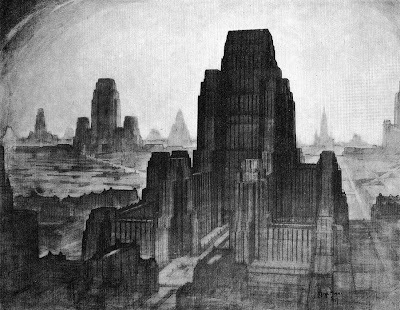 The Hugh Ferriss book The Metropolis of Tomorrow, originally published in 1929, is an amazing work broken up into three parts: Cities of Today, Projected Trends, and An Imaginary Metropolis. Needless to say, the last section is most intriguing for our purposes. The image below is a radial design for a city that pops up many times in the succeeding years, notably in Walt Disney's original design for EPCOT. 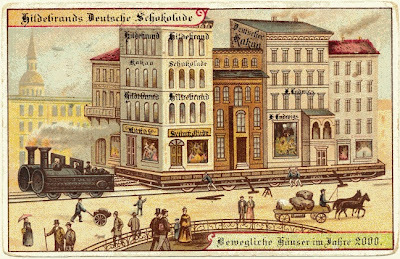 The first center to be seen is that structure, or complex of structures, in which the control of the business activities of the cities is housed. Here is located the seat of government of the city's practical affairs, including its three chief branches - legislative, judiciary and executive. At this closer view we can distinguish in greater detail the characteristics of the tower-buildings. The tower itself rises directly over the intersection of two of the master highways to a height of 1200 feet. There are eight flanking towers, half this height, which, with their connecting wings, enclose four city blocks. The center extends, however, over eight adjoining blocks, where its supplementary parts rise to a height of twelve stories. We see, upon examining the Avenue, that more than one level for traffic is provided. 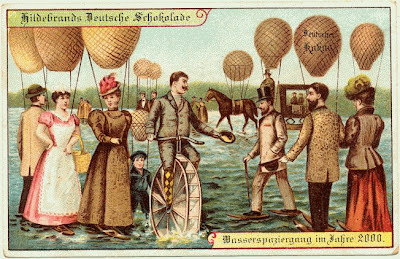 Local wheel traffic is on the ground level; express traffic is depressed; pedestrians pass on a separate plane above. Beyond the center, the lower districts of the city are visible, together with the radial avenues which lead to the other tower-buildings of the Business district. 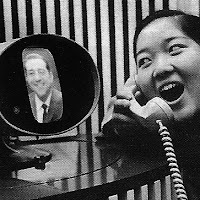 Today we have part 3 of the wonderfully paleo-futuristic video Connections: AT&T's Vision of the Future. 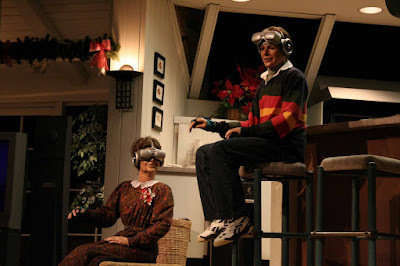 Being partial to past visions of virtual reality, this may be my favorite part of Connections. 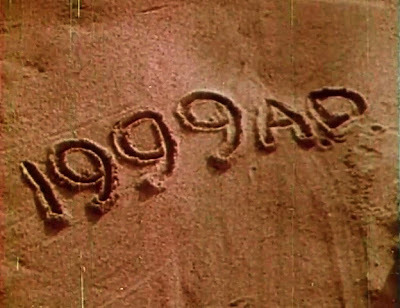 Whether it's your favorite part or not, we still have plenty of this 1993 video to examine. For the February, 1967 issue of The Futurist magazine, Hubert H. Humphrey, wrote a piece articulating his vision of the future. The Vice President broke up his thoughts into two categories; Developments of the Next 20 Years, and Far-Out Developments by A.D. 2000. In agriculture, the large-scale use of de-salinated sea water. In medicine, the transplantation of natural organs and the use of artificial ones. In psychiatry, the widespread application of drugs that control or modify the personality. In education, the use of more sophisticated teaching machines. 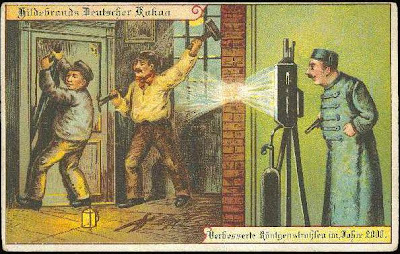 In wordwide communication, the everyday employment of translating machines. In industry, the extensive use of automation, up to and including some kinds of decision-making at the management level. In space, the establishment of a permanent base upon the moon. Some of you might say that there is nothing very surprising here. And you would be right. Experience shows that it takes 10 to 30 years for a new idea to make its way from its inception in a scientist's mind to its general application in everyday life. Therefore, the world of 20 years from now already exists, in embryo, in today's advanced research establishments. 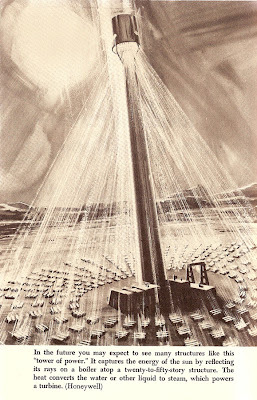 A theme in 1960's America that seems to pop up repeatedly is faith in a permanent moon base. Tomorrow we'll look at Hubert H. Humphrey's predicitions for the year 2000. Young Lisa Gilvar of Happy Hollow School in Wayland, Massachusetts submitted this picture for the Tricentennial Report, published in 1977. 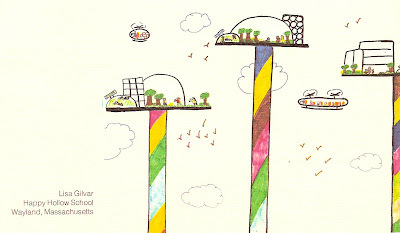 Domed habitats in the sky seem pretty cool to me. I might go with a different color scheme for the poles, but hey, I'm no designer of the future. The 1973 book 1994: the World of Tomorrow, published by U.S. News & World Report, starts with a preface that is optimistic yet thoughtful and measured. 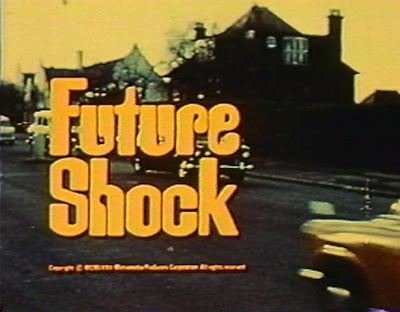 "Like George Orwell's work, 1994: The World of Tomorrow, offers a warning that the future cannot be taken for granted. The future is forseeable. Unless, as Orwell cautioned, we anticipate future problems, begin the search for alternative solutions, and stake a claim on our long-term future, we may lose what it has to offer." 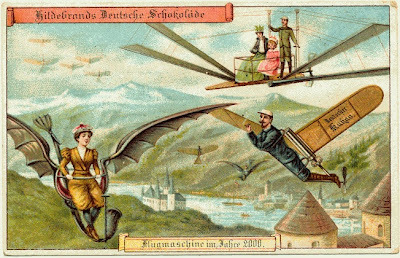 However, like any book of futuristic projections we quickly get to the fanciful visions. And let's be honest, would you read this blog without the spectacle of absurd, often wrong, predictions? 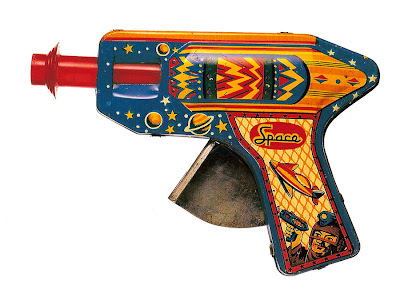 Stick around, because 1994 was a much cooler year than any of us ever knew. 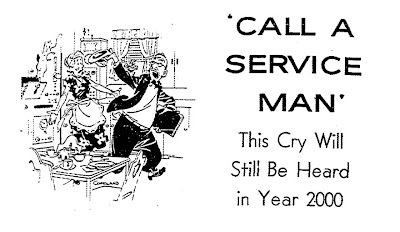 Part two of the September 13, 1959 Chicago Tribune article Call a Serviceman: This Cry Will Still Be Heard in Year 2000 offers more paleo-future goodness. To bring you up to speed, our housewife of the future has just heard the yelps of her poodle Fifi as it is being attacked by the futuristic vacuum cleaner. By the time I'm back in the house, the cleaner, having finished its job on Fifi, has scooted back to its cubbyhole in the baseboard. "I think," my daughter says, "you'd better call a service man." 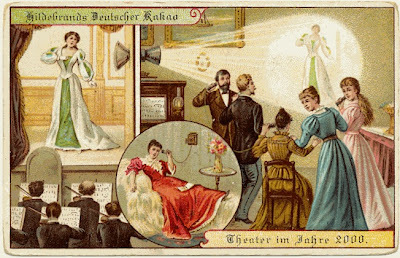 The vidiphone (telephone combined with television) signals for attention. A neighbor's face comes into view. Scowling, she says, "Your lawnmower is cutting all the flowers in my garden!" "O, dear! Something must be wrong with its radar eye!" "Yes," my neighbor agrees. "It needs glasses!" I call a service man. It seems the logical thing to do. Afterwards, I sink into a chair and pick up a book. A door slams and my son comes in, announcing, "I'm hungry." "I'll get something," my daughter volunteers. (That's what's so wonderful about the pushbutton age - everyone is willing to help with the work.) "We'll have peanut butter and jelly sandwiches," she proclaims, pushing a button. We wait, nervously, while the electronic-brain goes to work. Guess what - peanut butter and jelly sandwiches! 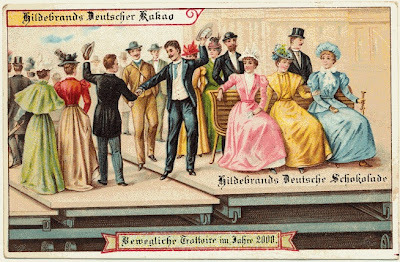 Only, instead of serving them on plates, the electronic brain tosses the sandwiches upward. They land on the ceiling. Stay tuned for part three of this riveting tale of domesticity. 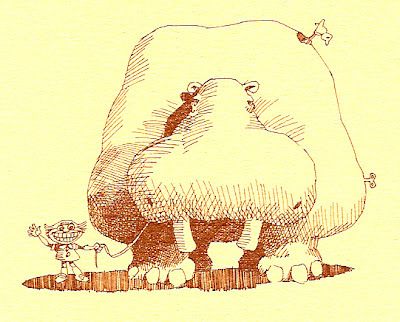 If you look to the sidebar you'll see that I've included a link to a new forum on Google Groups dedicated to Paleo-Future. 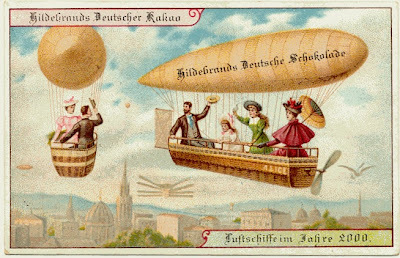 This forum will hopefully allow for more interactivity and allow readers of Paleo-Future a place to discuss paleo-futurism and present-day futurism, share resources and bring attention to important links. I've started the group with a handful of topics that I often discuss here on the Paleo-Future blog. Your input is always welcome, whether it be here on the blog or on the newly created message boards. Thanks for reading and let me know what you think of this new experiment.